Just a year ago, a study revealed that Australian businesses are falling behind the rest of the world when it comes to recycling. The study, conducted by the nation’s leading waste and recycling experts Business Waste, found that most companies are without a green policy and fail to separate their waste into recyclables and non-recyclables. Ultimately, this means that business waste is being sent straight to landfill. Unfortunately, our poor track record when it comes to recycling is not through lack of infrastructure; it is simply a case of businesses not having the correct policies in place to dispose of their waste in an environmentally friendly manner. This is where Metropolitan Shredding Service can step in and reduce both your company’s environmental impact as well as the costs associated with disposal. For just $66.00 per bin, based on a two bin minimum, we can help your business move towards reducing your impact on the environment. 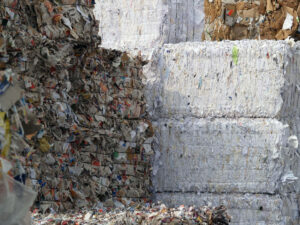 Metropolitan Shredding Service recycles all shredded documents to ensure there is no waste left behind.